Like Pinger, Talkatone allows you to make phone calls using Wifi. Unlike Pinger, Talkatone uses Google Voice as a channel to let you make and receive phone calls to and from your phone contacts, for free. 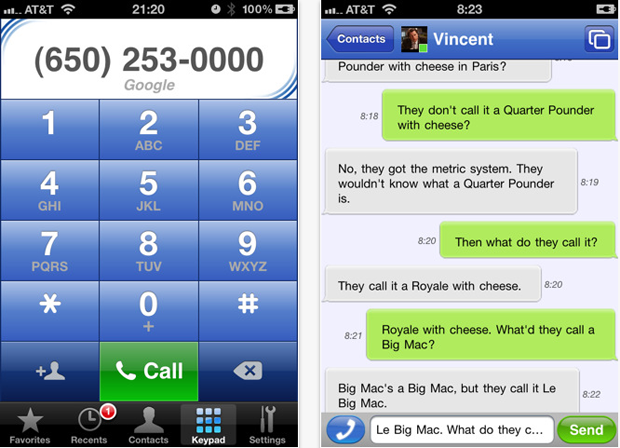 While Pinger, using Textfree with voice, gives you a certain amount of minutes free and then charges your iTunes account or asks you to complete tasks, Talkatone, after some jiggering of your Google Voice account, allows you to make unlimited calls without having to jump through any additional hoops. To set Talktone up log into your Gmail account and select the “Call Phone” option under Chat. Use the “Call Phone” option to make one call to a regular phone number. Then sign out from Google Chat and return to Talkatone. Make a phone call from its phone widget and you should be good to go there. In order to receive incoming calls, you have to upgrade your Google Voice account to get a phone number and select “Forward to Google Chat” on the Voice Settings page. You can then receive calls to your Google Voice number in Talkatone. This latest Talkatone release also lets users in the US and Canada send and receive unlimited SMS messages via Wifi, using just their data plans. It includes an audio compression upgrade to improve voice quality over weaker networks. Talkatone is particularly useful for phone deadzones like TechCrunch offices, but might be a godsend for people who turn off their cell service on trips abroad and just use their data plans. Imagine being able to make calls from French hotel Wifi or even on a plane? You can try Talkatone for free here.